"It has given me tremendous pleasure to serve the University and watch it grow and develop over the years. 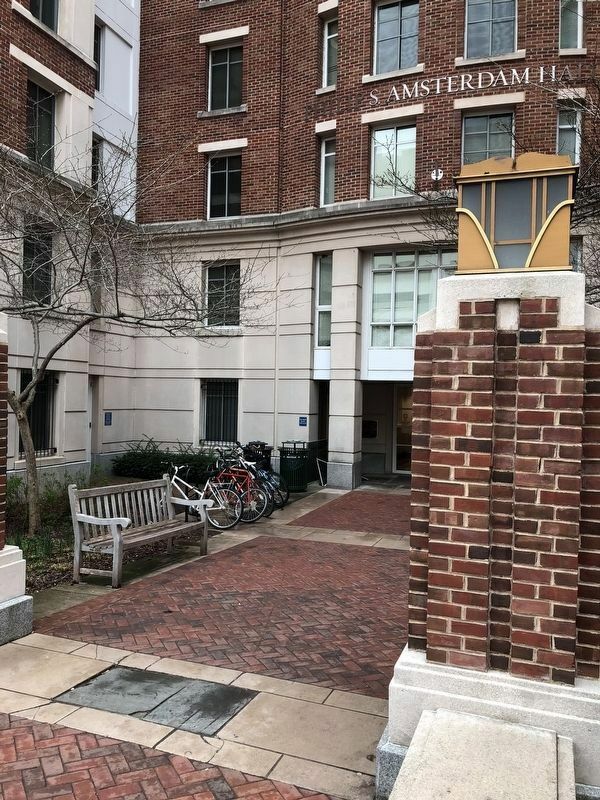 My time as a GW undergraduate was a unique experience that laid the foundation for future success and helped shape my commitment to business and public service." 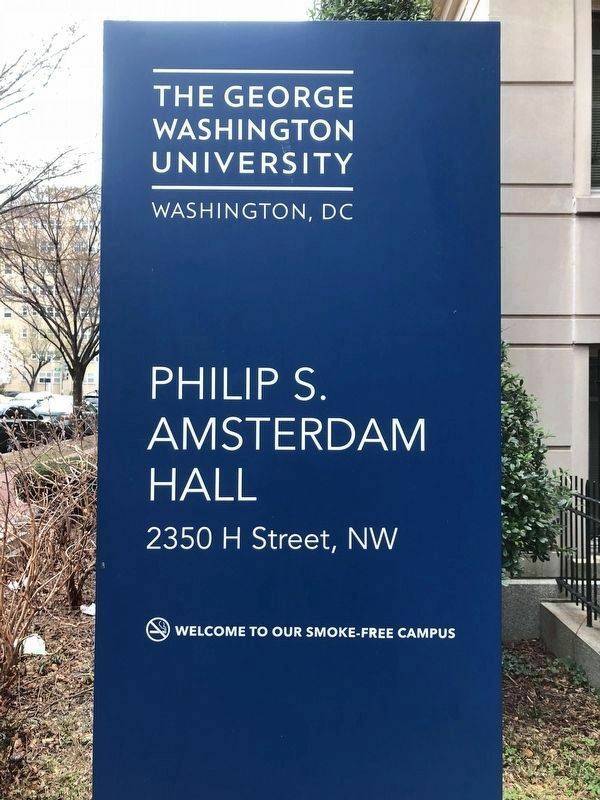 For nearly half of a century, Philip S. Amsterdam demonstrated an enduring dedication to The George Washington University through service and philanthropy. He was a charter member of the National Council for Arts and Sciences beginning in 1993 and served as a GW trustee from 1999 to 2007. In 2007, he received GW's Distinguished Alumni Service Award and as an Honorary Doctor of Laws degree for his volunteer efforts and service to the Department of Anthropology and the Stephen Joel Trachtenberg School of Public Policy and Public Administration. Amsterdam was a successful businessman. During his lifetime, he was president and CEO of several commercial building and highway contracting companies. 2009 by The George Washington University. Location. 38° 53.962′ N, 77° 3.057′ W. Marker is in Foggy Bottom, District of Columbia, in Washington. Marker is on H Street Northwest east of 24th Street Northwest, on the right when traveling east. Touch for map. Marker is at or near this postal address: 2350 H Street Northwest, Washington DC 20037, United States of America. Touch for directions. Other nearby markers. At least 8 other markers are within walking distance of this marker. The American Meridian (within shouting distance of this marker); Site of 2310 H Street, Northwest (within shouting distance of this marker); St. Mary’s Episcopal Church (within shouting distance of this marker); John A. Wilson, D.P.S. '92 (about 400 feet away, measured in a direct line); Liberty Baptist Church (about 400 feet away); Carol Brown Goldberg (about 400 feet away); Sheen Hok Gate (about 500 feet away); Leonard A. Grimes (about 600 feet away). Touch for a list and map of all markers in Foggy Bottom. More. 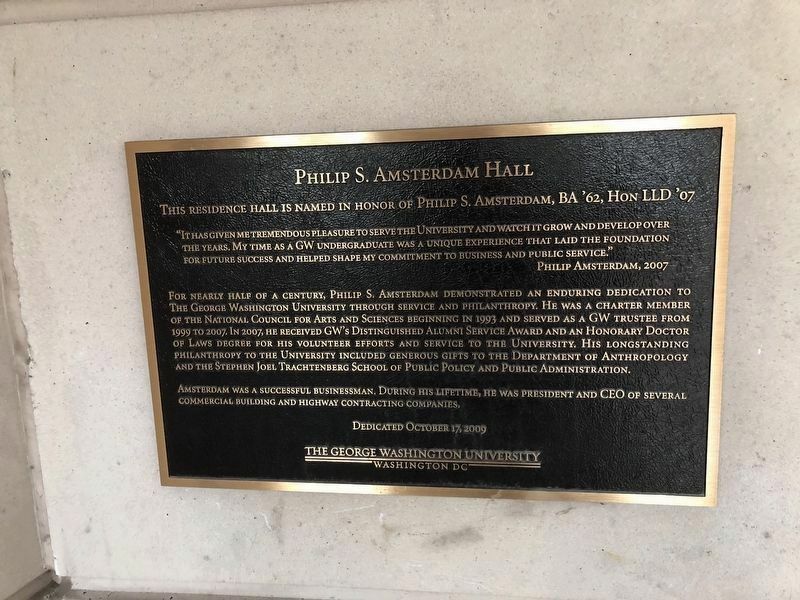 Search the internet for Philip S. Amsterdam Hall. Credits. This page was last revised on March 22, 2019. This page originally submitted on April 3, 2018, by Devry Becker Jones of Washington, District of Columbia. This page has been viewed 66 times since then and 13 times this year. Photos: 1, 2, 3. submitted on April 3, 2018, by Devry Becker Jones of Washington, District of Columbia. • Bill Pfingsten was the editor who published this page.